The 70th Anniversary of D-Day is fast approaching! In just a few weeks, we will all gather to commemorate the veterans we lost and those who survived. Throughout my time at the Memorial, I have come across a number of people who visited Normandy and each time I am anxious to hear what they thought of the area and the local people. I had the privilege of traveling to Normandy as part of a three week Study Abroad trip and I have developed my own opinions of the area. Thus far, traveling to Normandy has been the greatest experience of my life. I have traveled to Europe before but nothing was quite like this trip and I believe it has everything to do with the people and the history of the area. The legacy and the impact that Operation Overlord has on the northern part of France is still seen today and is a major part of their local history. 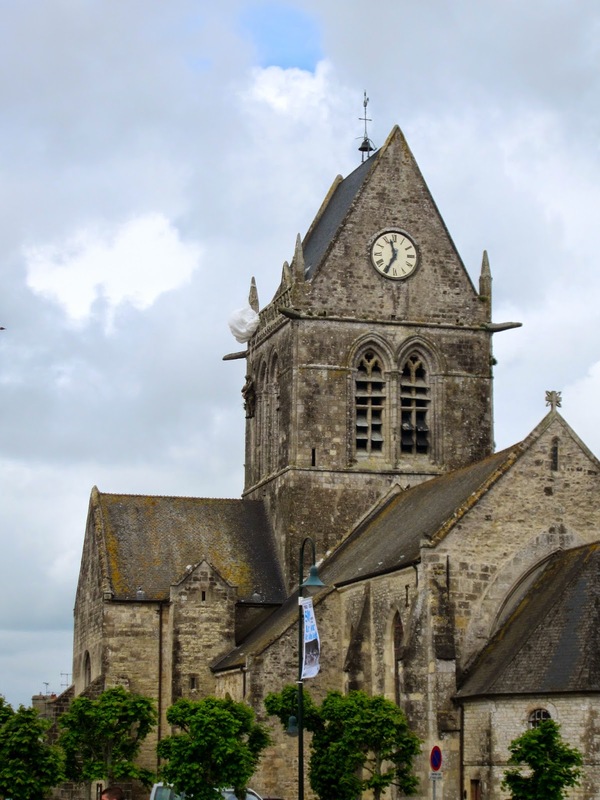 Within a few days, we visited Sainte-Mere-Eglise Church, Utah Beach, Pointe du Hoc, Omaha Beach, the American Military War Cemetery, and the town of St. Lo. What struck me the most was how much they honor World War II, D-Day specifically, all around the area. Almost every locality has their specific dedication site or memorial. History is alive and well in the area, even the ‘ruins’ of the actual landing sites. Except for Omaha Beach, every landing site has ruminants of the invasion, from the German bunkers with guns still present to the craters left behind by Allied bombs. They even left barbed wire attached in some spots. The only identifier on Omaha Beach is a monument, resembling a bunker, honoring the National Guard units that landed on that particular beach. Now, looking back, I am not sure what I expected to see left on that beach, but I remember feeling surprised there was not more, compared to all the other sites. The beach is flat and serene and there are a series of homes along the beach line. It looked as though life on the beach just picked up where it had left off and the battle that had taken place was in the very distant past. I was somewhat saddened to see it like that, especially because all the other places were so well preserved. But it was nice to see that even though such a tragic event, and a horrific number of men lost their lives on that beach, the area was able to move forward and honor in their own way. recommend spending time in Normandy, France. Not only is it a beautiful area, but also it is well worth the experience to see the D-Day sites. It was an honor to part of such an amazing trip. Thank you so much for this blog. Every American should know about the victories and the great sacrifices of this time in history. My Dad was at Normandy. I never heard him talk about his time there until the 50th anniversary and the Roanoke Times had a large article about the Invasion. I wish I had a recording of what he said. I was so 'taken back' to hear that he was there that I can't remember all he said. I kept thinking 'I wouldn't be here if he hadn't come home'. I do remember that his Navy ship was creating smoke screens to aid the Invasion. He almost suffocated in the task. Thanks for all the research here. All the entries are very interesting.